Not only Monsanto (Article taken from the German Coordination gegen BAYER-Gefahren – October 2013) The discussion on genetically modified seeds is dominated by the criticism directed against Monsanto. In the wake of Monsanto the German company Bayer has become one of the largest agricultural corporations in the world. Already, Bayer is one of the leading suppliers of pesticides and seeds. A current enquiry at the European Patent Office shows that in terms of the number of GMO patents Bayer actually comes first. 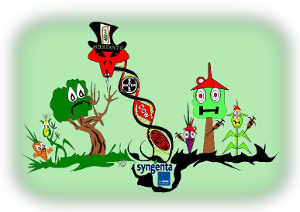 Maize, wheat, rice, barley, soy, cotton, sugar beet, rapeseed, potatoes, tobacco, tomatoes, grapes – the list of transgenic plants, on which Bayer Cropscience owns patents, is long. The corporation has even taken out patents on genetically modified trees, for example poplars, pine trees and eucalyptus. This is the result of an enquiry by the Coalition against Bayer Dangers and No Patents on Seeds! at the European Patent Office (EPO) in Munich, Germany. For this purpose the initiatives scrutinised all patent applications submitted by Bayer over the last 20 years. According to the investigation the company owns 206 of the total number of 2,000 patents on transgenic plants issued in Europe. This puts Bayer in the number one spot – even before Pioneer (179), BASF (144), Syngenta (135) and Monsanto (119). With an international market share of 20 percent Bayer Cropscience, a wholly-owned subsidiary of Bayer AG, is the second largest pesticide producer in the world (after Syngenta). For seeds the company is in seventh place with a market share of 3 percent. The concentration process in the agricultural market has been ongoing for decades. The ten biggest corporations own a market share for pesticides and seeds of over 70 percent. It is the aim of this oligopoly to carve up the market amongst itself, dictate prices, steer the political framework and ultimately control how humanity will grow food. “If you control the oil you control the country; if you control food, you control the population,” former US Secretary of State Henry Kissinger once remarked. To this end patents on plants and animals are an essential means. Already in 2008 the International Assessment of Agricultural Science and Technology for Development (IAASTD), initiated by the United Nations and the World Bank warned that research and dissemination of knowledge is being restricted by the increasing registration of patents. Especially in developing countries this would prevent locally adapted agricultural practices contributing to food security and economic sustainability. Monsanto is the biggest supplier of genetically modified seeds in the world – by a long way. The corporation has acquired dozens of smaller seed producers and cultivators, thus achieving a share of the seed market of around 27 percent. The US company is also way ahead with the package deals with herbicides and GMOs: 95 percent of GMO soy and 75 percent of GMO plants, such as maize or cotton, are resistant to the pesticide glyphosate (trade name: Roundup) developed by Monsanto. Studies suggest that the use of this agent can cause birth defects as well as cancer. More and more farmers and farm workers are being poisoned, especially in Latin America. Contrary to the constant promises made by industry, the application of genetically modified plants has not decreased the use of pesticides in any way, but instead caused it to continually increase. Public criticism directed at Monsanto is therefore totally justified. This is a comfortable situation for the German companies Bayer and BASF because it means they are hardly the subject of public debate. However, the Bayer pesticide glufosinate, chemically related to glyphosate and also supplied in combination with herbicide-tolerant seeds, is just as dangerous. The active agent can cause deformities in foetuses and is therefore classified as a reproductive toxin. That is why the substance must be withdrawn from sale in the EU by 2017 at the latest. 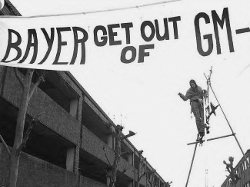 This has not prevented Bayer from announcing in May 2013 to build a huge new glufosinate factory in the USA. With this the corporation wants to close the gap caused by the increasing inefficacy of glyphosate against weeds. When it comes to “green GMO technology” Bayer has been catching up steadily. Since the 1980s the corporation has been carrying out research with genetically modified plants. In 2001 it rose to the top league through the takeover of Avenetis Cropscience, which itself was created out of the GMO divisions of Schering, Rhone Poulenc and Hoechst. Then Bayer bought companies such as Plant Genetics Systems, Planttec, Prosoy Genetics and Athenix. In addition it entered into cooperation agreements with biotech companies such as Evogene (research on rice), Mertec (soy) and Futuregene (cotton) as well as research institutes such as the Commonwealth Scientific and Industrial Research Organisation (wheat) and the Brazilian Centre for Sugarcane Technology. Currently Bayer achieves its highest sales with cotton seeds, where the company holds 18 GMO patents. 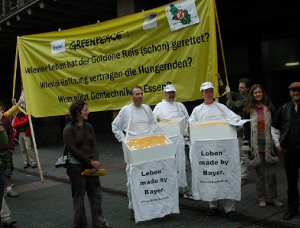 Bayer also supplies genetically modified rapeseed, sugarcane, maize and soy. It is already ten years since the company applied for a EU import licence for their herbicide resistant rice LL62. The current enquiry shows that Bayer has submitted a total of 771 applications at the European Patent Office (EPA) in the last twenty years. These were accepted in 206 cases (see table). Not one but two German companies were in the lead with the number of patents issued in the last three years: BASF (69) and Bayer (56). Bayer holds 26 patents solely for starch and sugar. Its aim is to produce starch for industrial use through genetically modified plants. Genetic modification is also a means to produce specific kinds of sugar for special applications. 23 Bayer patents are in relation to resistances against herbicides. The patents on glufosinate are partially from the 1980s and have expired by now. To extend the duration Bayer has made small changes to the DNA of important plants such as soy and cotton and applied for new patents on them. Since the patent on the Monsanto product glyphosate has expired as well, Bayer is now producing this agent itself and is holding ten own patents on glyphosate technologies. For example, patent number EP 1994158 describes a glyphosate resistance process for which Bayer has registered claims on as many as 23 different plants. These include maize, wheat, barley, soy and rice, various trees and even grass. In August 2011, Bayer received an EU import permission for glufosinate-resistant soy of the type known as A5547-127. This type of soy will be grown mainly in South America and imported to Europe as animal feed. Only a few months earlier, the company had been given a patent on this soy bean, which will be valid until 2026. The patent will also give the company the exclusive right to test seeds for contamination with this genetically modified type of soy, which might be intended to prevent independent testing. A glufosinate-resistent plant was also responsible for the biggest contamination scandal in the history of genetic engineering so far: in 2006, genetically modified rice of the type LL601 turned up in supermarkets all over the world, even though there was no permit whatsoever. Slightly more than 30% of the crop from the US was contaminated. The EU and Japan stopped all rice imports from North America. 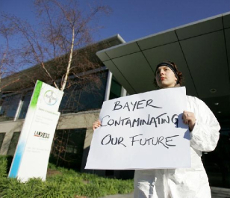 In 2012 Bayer had to pay compensation fees of more than $900 million to the farmers who were affected by this. LL601 still exists and is regularly detected in conventionally traded rice. Farmers have been producing their own seeds for thousands of years. They have created types of plants that are optimally adapted to local conditions. This self-perpetuating method is obviously problematic for the large seeds producers. The agricultural giants’ worst trick against the free reproduction of seeds is so-called “terminator technology”: this means that a genetic modification causes the plants to become sterile after one single sowing, forcing farmers to buy new seeds every year. All of the large agricultural companies perform research into “terminator” seeds and have registered patents in this field. Having taken over the company Hoechst Schering Agrevo GmbH (later Aventis), Bayer also owns “terminator” patents. They are called, for example, “Process for Producing Plants with Female Sterility”. Terminator plants are not currently used, as there has been a moratorium due to the UN Convention on Biological Diversity since 2000. However, this moratorium is not legally binding. There have been several attempts to weaken the ban. If they were successful, it would be an immense threat to biodiversity and to the food security of millions of people who live only on agriculture – especially in developing countries. Therefore, environmental initiatives from all over the world demand a permanent ban on this technology and also of relevant patents. Despite the large number of patents and co-operations, Bayer’s genetic engineering programme is mainly based on only two techniques: first, herbicide-resistant seeds sold in combination with the pesticides glufosinate or glyphosate; second, plants that contain the poisonous bacterium Bacillus thuringiensis (Bt), which kills insects. Both methods have been on the market since the 1990s. Due to the dangers they cause to humans and the environment, the Coalition against Bayer Dangers demands that glufosinate and glyphosate must be taken off the market immediately. Since the genetically modified plants are losing more and more of their effect, Bayer has exchanged many patents with Monsanto, Dupont, Syngenta and DOW. The companies now also use methods of their competitors and offer seeds that are immune to two or even three herbicides. In 2012, a type of soy was introduced that was tolerant of glufosinate, glyphosate and 24,D (the latter was part of the defoliant Agent Orange). Monsanto has even recently applied for an EU import permission for “Smartstax” sweetcorn, which is not only immune to glufosinate and glyphosate, but also contains six Bacillus thuringiensis (Bt) toxins. Over the past 25 years Bayer and others have not managed to shake the European consumers’ scepticism towards genetic engineering. BASF has given up and moved its entire GMO research to the US. In addition, the prophecies made about genetic modification have turned out to be incorrect. Yields did not rise significantly, and the use of pesticides was not reduced. For all of those reasons, Bayer is now intensifying its use of conventional methods of growing plants again. However, conventional growing is only profitable if the company has patent rights for it, so Bayer aims to obtain these – and has previously been successful. In August 2011, the European Patent Office granted a patent for growing plants with increased resistance to stress (patent EP1616013). The patent is valid until 2024. Stress factors are, for example, dryness, bright light, heat or scarcity of nutrients. Just over 100 of 2,000 plant patents issued by the European Patent Office are for such conventionally grown plants. It is also common to take plants that were grown conventionally and genetically modified later, since obtaining a patent right is easier this way. By issuing such patents, the EPO approves of grown plants being declared an “invention” and genetic resources being monopolised. This shows that international patent law has changed significantly. Both the Strasbourg Patent Convention in 1963 and the European Patent Convention in 1977 excluded property claims relating to “essentially biological procedures”. Breeds of animals or plants or animal and plant species were not considered inventions that deserved protection – the purpose of this decision was to protect life processes from becoming trading goods. This would have made it almost impossible for genetic engineering to become a profitable economic sector. Therefore the lobby groups of Bayer and others did their utmost to reinterpret the laws through legal trickery. Their breakthrough came in 1980, when a US patent office issued a copyright for a bacterium, arguing that it was much more similar to a lifeless chemical compound than to a horse, bee or raspberry. It went swiftly on from there. In 1988, Harvard University succeeded in gaining intellectual property rights on the so-called OncoMouse (a mouse that is especially susceptible to cancer) and immediately entered a licence contract with the pharmaceutical company DuPont. Nowadays the European Patent Office even issues property rights for conventionally grown plants. However, there is a glimmer of hope. During its last meeting before the summer break, the German Parliament decided to change the German patent law to ban the granting of intellectual property rights to conventionally-bred animals and plants. It is true that this law will not affect the practices of the EPO, but hopefully other countries will follow suit and ban patents for living organisms.